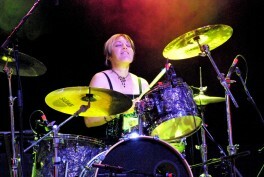 Dale Anne Brendon has been playing the drums since she first saw KISS perform. She studied music at Western University and jazz drumming at Humber College. In this episode, Brendon talks about her drumming career, from performing with Orchestra London to touring with Jesus Christ Superstar. Currently she’s drumming in Tommy at the Stratford Festival. Drummers and productions she’s worked with include Roger Hodgson (Supertramp), Morgan Davis , and Jeans and Classics. She also mentions drummers such as Travis Barker (Blink-182), Kenny Aronoff, Graham Lear, and Glenn Kotche. Check out episodes that also mention Music, Stratford, Theatre, Western University.